There are only three countries in the world with wine markets that are larger than that of Germany: the US, France and Italy. All three countries have significant winemaking industries. However, in contrast to Germany, the populations of those countries prefer to drink domestic wines. The French and the Italians in particular are very patriotic when it comes to wine consumption. It is difficult to sell foreign wine in those markets. The German wine market is much different. It is by far the most liberal wine market in the world with volume that has remained stable at approximately 20 million hectoliters for years. German wine consumers have a large selection that includes a range of wines from around the world, and they take advantage of that. German wine production from a total of some 100,000 hectares of vineyards covers about 35 percent of the wine consumed in Germany. French and Italian wines account for approximately 15 to 18 percent. Wines from Spain, the third Mediterranean wine-producing country in Europe and the one with the world’s largest vineyard acreage, account for approximately ten percent of the wine on the German market, and the remaining ten to 15 percent comes from the four main overseas countries, i.e. USA/California, Chile, South Africa and Australia, as well as considerably smaller shares from Austria, Portugal and Greece. The rest of the list is long and includes some 70 countries around the world, many of them with quite exotic sounding names such as Armenia, Bulgaria, Cypress and Uruguay. The hotly contested wine market will ensure that the use of innovative solutions for the digital beverage factories of the future will be essential to bottlers and wineries in the future. Krones, a company whose exhibits occupy a total of 11,000 square meters of space at drinktec in Munich, will present exactly those kinds of future-proof solutions in September. For consumers, the range of products may often appear confusingly large because they are broken down according to completely different wine regions and wine styles in the various countries. The wine-producing country of Italy, which has 20 wine regions and a number of well-known wines—from Prosecco and Bardolino to currently popular wines from the Primitivo grapes in Apulia or wines from Nero d’Avola in Sicily—is a wine universe in its own right. Structures, i.e. how German and imported wines make their way to consumers, is the other side of the equation. After all, this is the final instance that keeps wine consumption moving on the market. In the case of German wine production, which amounted to an average of nine million hectoliters last year, if you exclude one million hectoliters in exports, that leaves eight million hectoliters for the German market. Together with the approximately twelve million hectoliters of wine that are imported to Germany, that results in an overall market volume of 20 million hectoliters or two billion liters of wine that consumers in Germany drink every year—average consumption amounting to 24 liters of wine and sparkling wine per resident. Direct marketing—above all on the part of German wine-growing estates and winegrower cooperatives, which produce more than a third of Germany wine—plays a major role in the sale of German wines. 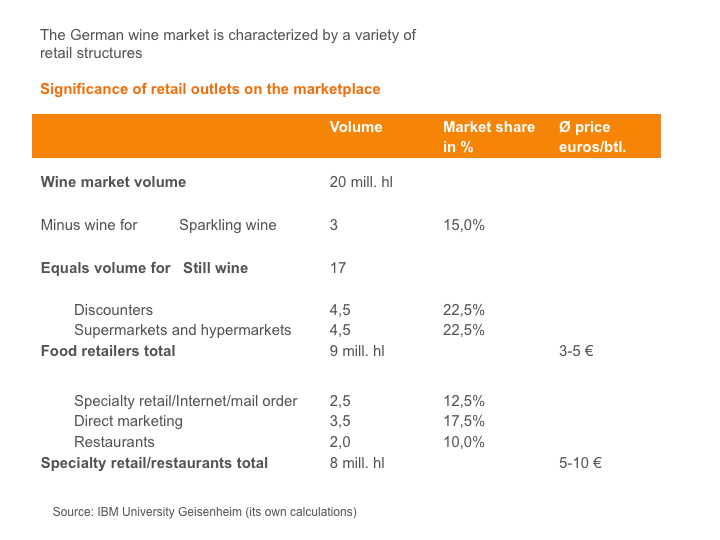 Retail food outlets are responsible for another large percentage of sales—and the largest share of foreign wines. Some nine million hectoliters or approximately 1.2 billion bottles of wine pass through the checkout lines of Germany’s two major retail groups, Edeka and Rewe, and the six nationwide discount retailers, Aldi Süd, Aldi Nord, Lidl, Netto, Norma and Penny. In the food retail sector, which has more than 40,000 points of sale, the leading eight groups of companies account for more than 95 percent of sales. Add to that wine specialty retailers and wholesalers, which deliver to end consumers and restaurants and have their own brick-and-mortar and Internet-based online shops. The specialty retail sector has approximately 3,000 companies, and there are also a large number of additional retail outlets for wine. They all have a great deal of business potential on the liberal German wine market. To gain a foothold on the German market, all suppliers around the world must comply with the standards that are prescribed by relevant EU regulations and German laws that pertain to food and wine. Companies exhibiting at SIMEI@drinktec in Munich from September 11–15, 2017 will present all the components of a modern production operation—from hygiene standards and product safety to the complete range of technology needed to produce, treat and bottle wine. Competition calls for efficient and, therefore, cost-effective production, which is not possible without using modern filling technologies and materials, from bottles to closures. That is why the SIMEI Innovation Challenge recognizes particularly outstanding innovations and creativity in viniculture and wine production with the coveted Lucio Mastroberardino Innovation Award. The SIMEI Knowledge & Innovation Area also features several workshops and lectures where visitors can find out all about the wine industry. Topics related to process automation, which is expected to make its way into the wine industry in the future, are discussed in the drinktec Forum. You can find out exactly what role modern technology plays in viniculture in this blog article. 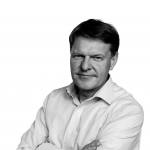 Dr. Hermann Pilz has been in charge of the trade magazine WEINWIRTSCHAFT as chief editor for over 20 years. He loves writing about many different topics of the wine and spirits industry. Wine: In vino veritas – but some misconceptions, too! 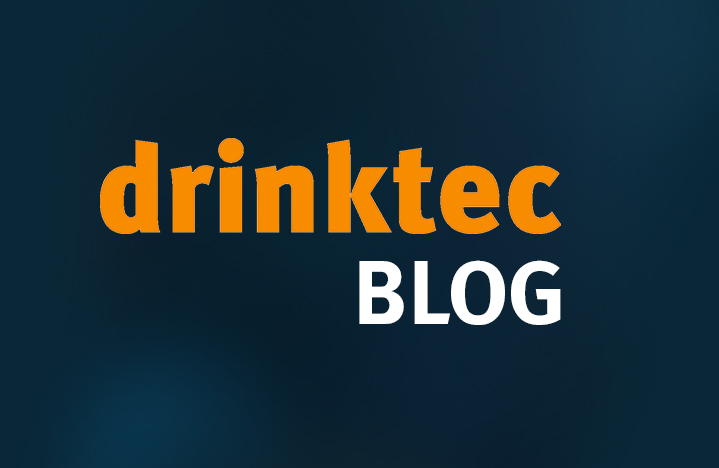 drinktec blog © 2018. All rights reserved.